Jan and I really enjoyed our stay at Horse Creek Corps of Engineer Campground. Very quiet, probably because most campers want electric and water hookups. Good walking and bicycling. Part of the same Corps area is a day use section. 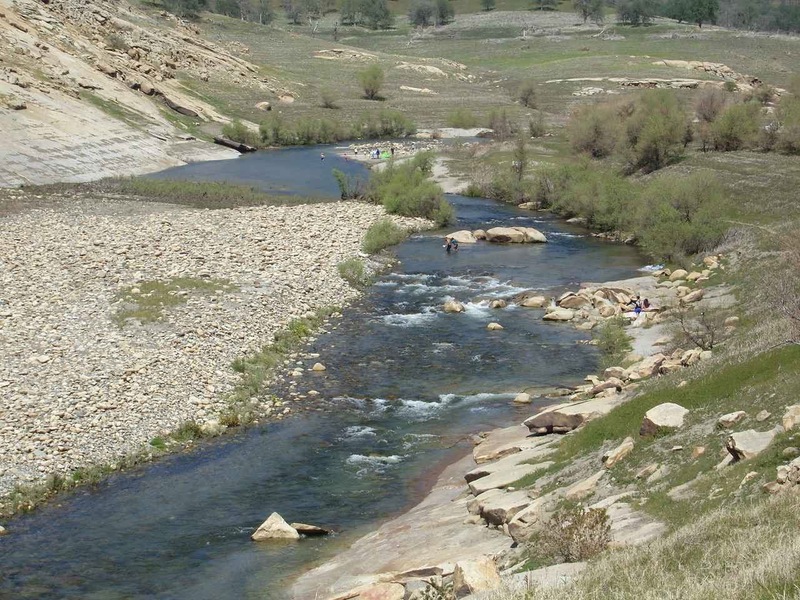 On the weekend a number of families take advantage of the Kaweah River. Not much swimming, but with temperatures in the 80's, everyone was enjoying a little wading. This is snow melt water after all-----still a bit chilly. 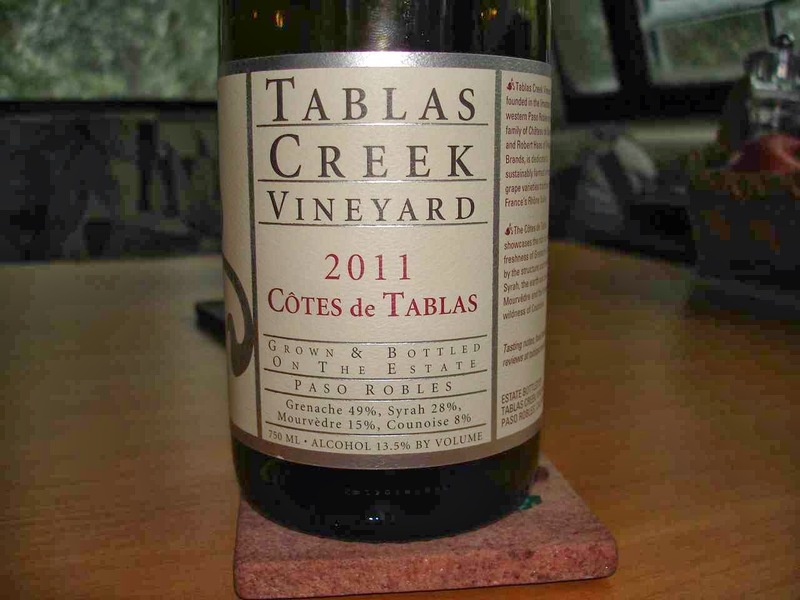 We enjoyed a nice steak cooked over the charcoal grill and accompanied by this Cotes de Tablas wine from one of our tastings in Paso Robles. A wine modeled after the Rhone wines in France with the same grape stock imported from France. It is a blend of Grenache,Syrah,Mouvedre, and Counoise grapes. We certainly enjoyed it.! Sometimes the labels make for good reading. If you click on the pictures, remember, you can enlarge them for better viewing. 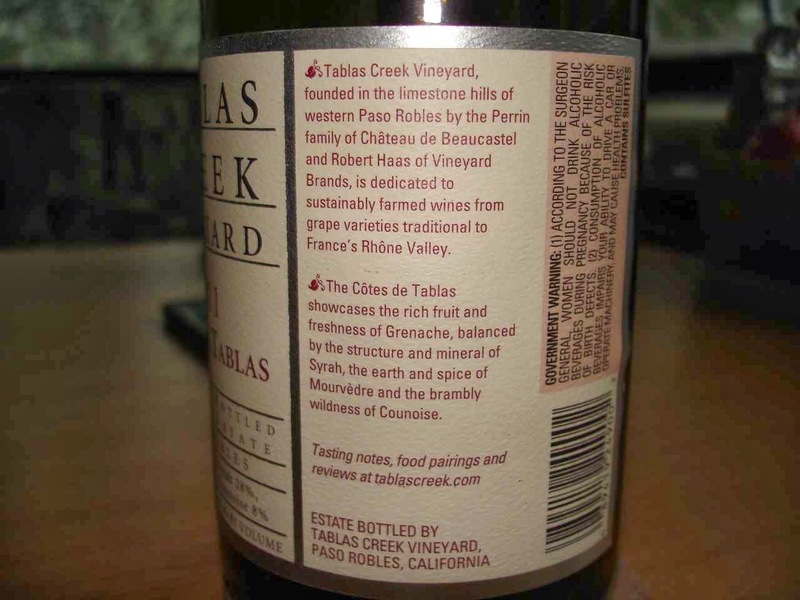 I love the vocabulary used in wine descriptions. On the left you may note "brambly wildness"
One of the wines at Justin Winery used "pencil lead"
On our way to the north entrance of Sequoia. But first, a stop in Lemon Cove for our mail pickup. 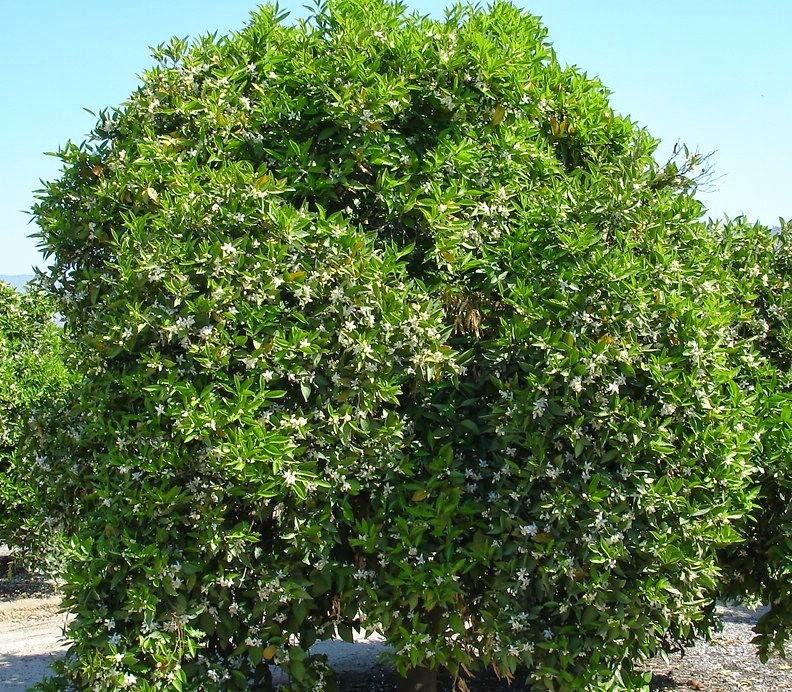 Well before you reach the center of town, you can smell the sweet fragrance of orange blossoms from the acres and acres of orange groves. As you can see in the picture, the trees are covered with blossoms. 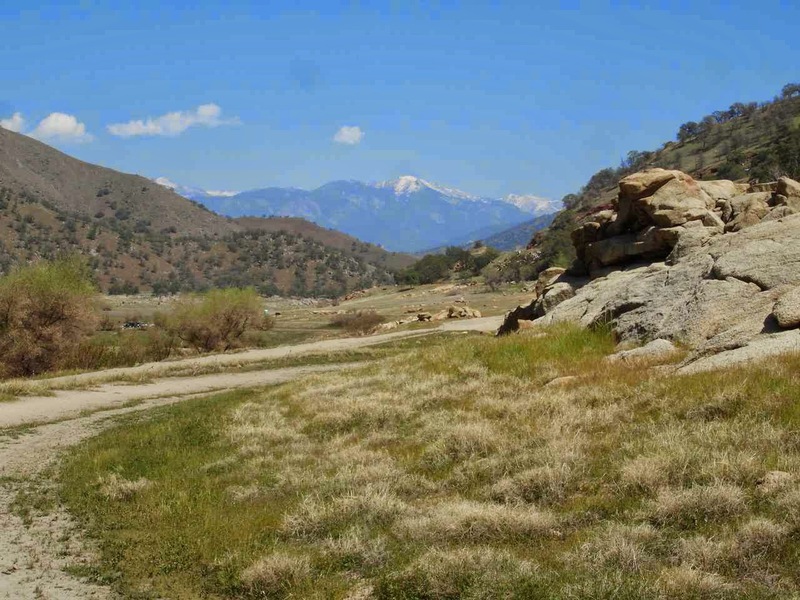 From Dinuba , a grocery stop, at the elevation of about 600 feet., it is a short ride up to our campground at Kings Canyon National Park. 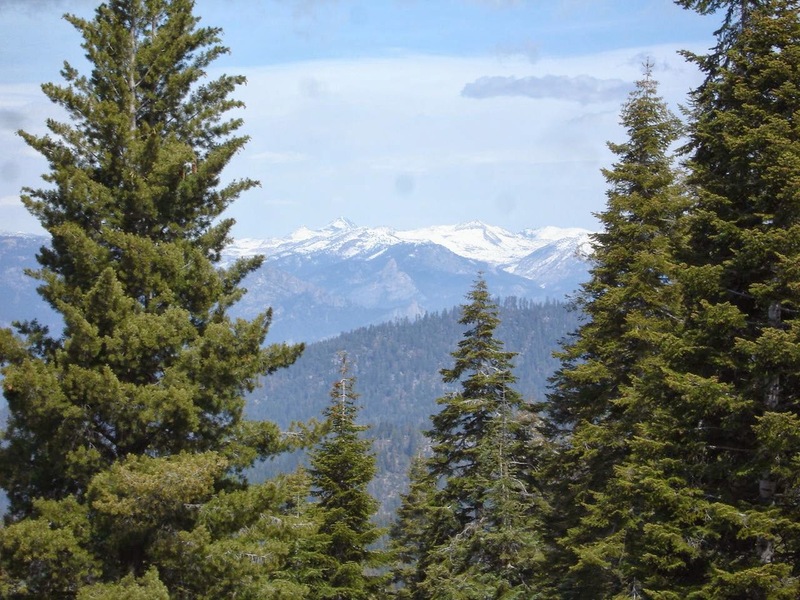 The elevation of Azalea Campground is around 6500 feet and about 24 degrees cooler. When you look at a map, you can see that there are different areas of this Sierra Nevada park system. 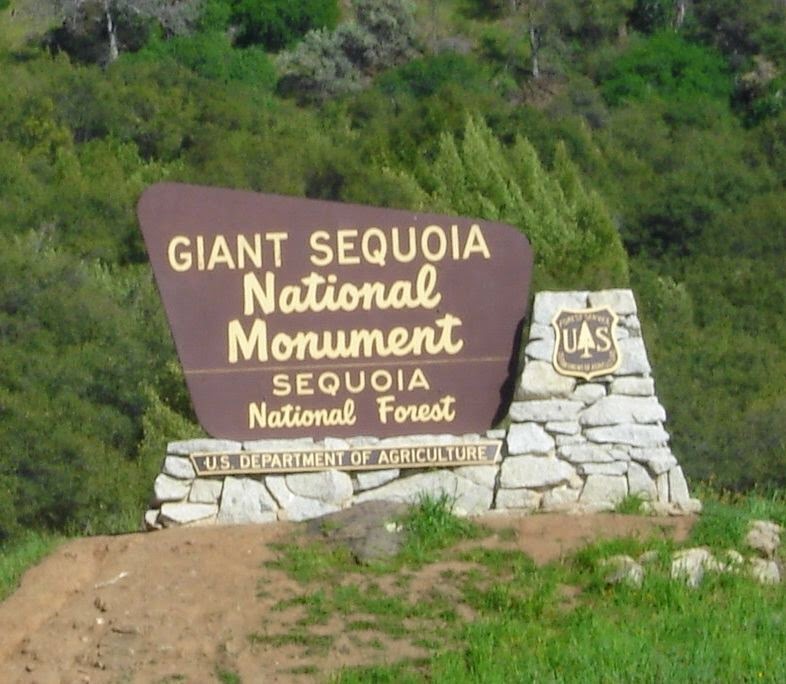 Some sections are National Forest, some are Kings Canyon National Park, and some are Giant Sequoia National Monument or Sequoia National Park. And more! Can be confusing, but all beautiful country. 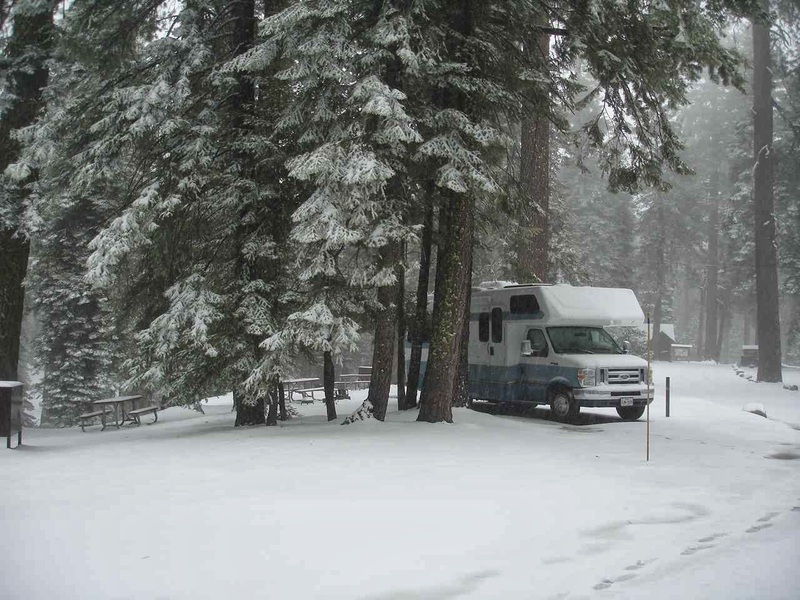 Our campground, Azalea, is part of the Grants Grove section on route 180 which connects right on to the Generals Highway(198) through Sequoia. 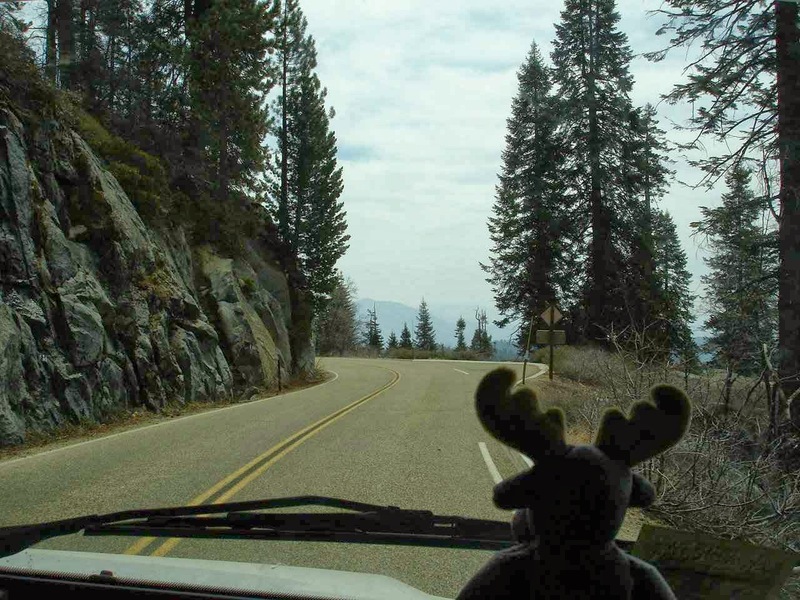 It is another mountain road at 6,500 to 8,000 feet or so elevation. There are curves and views galore. Keep an eye out there Eustis!! Good thing, Eustis!! 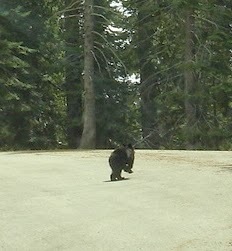 We had to slow down for a black bear that ran down a rock ledge on the left and then jogged across the road. The views from the Generals Highway are spectacular, even with the haze. And then---all of a sudden--- you realize that there are not only these really tall pine trees, but there are these huge Sequoias. So hard to have a picture do justice, but you can see how small Jan is in front of this cluster. 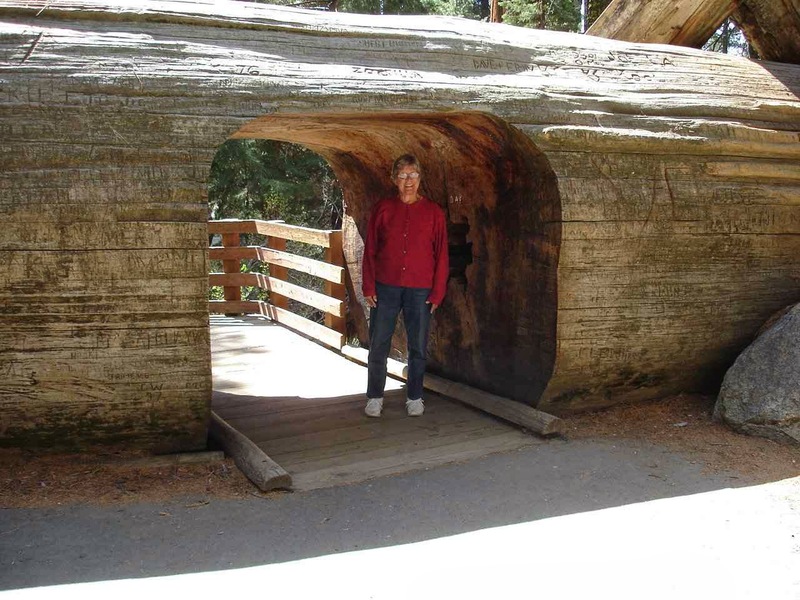 Even Bruce looks a little small in front of the General Sherman tree. 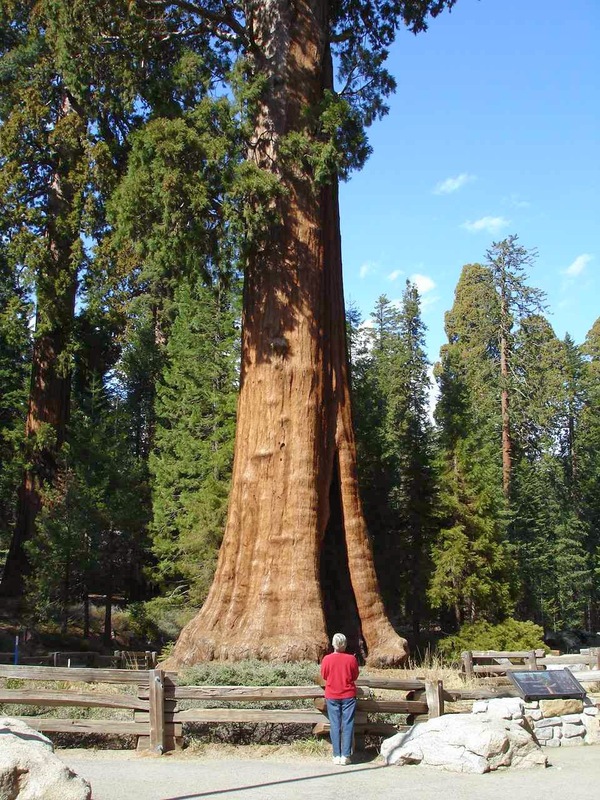 This tree is the largest living thing on earth. Isn't that something! And it keeps growing each year. The top has stopped growing, but the tree keeps adding girth to the tune of a whole large normal 60 foot tall tree---every year. In the area is a downed tree that has a tunnel for walking. There used to be live trees that you could drive through, but now the park is trying to preserve the trees in their natural state. 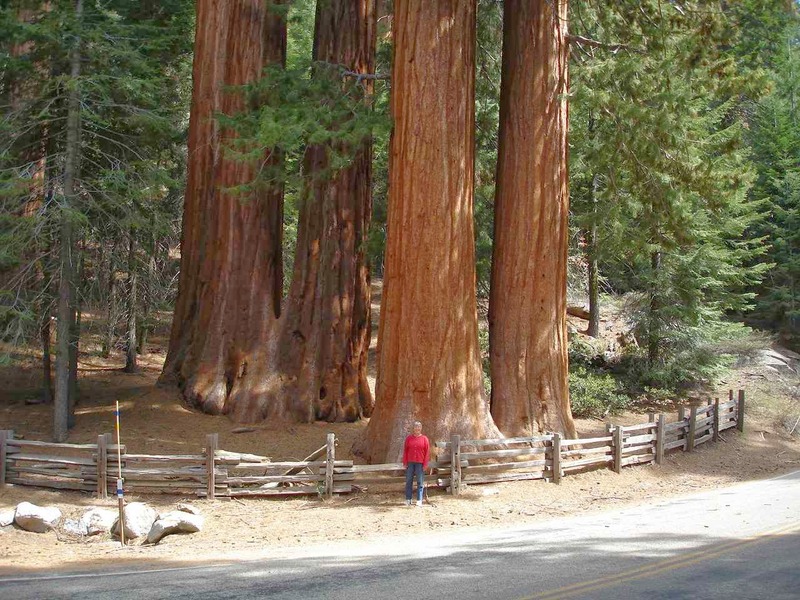 These trees like General Sherman are anywhere from 1600 to 2 or 3 thousand years old. 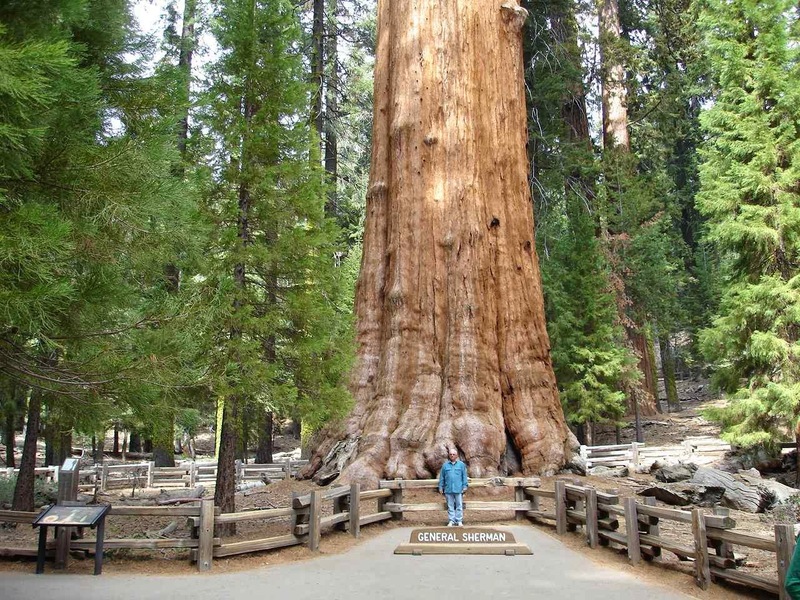 General Sherman is estimated to be 2,200 years old. The same tree. 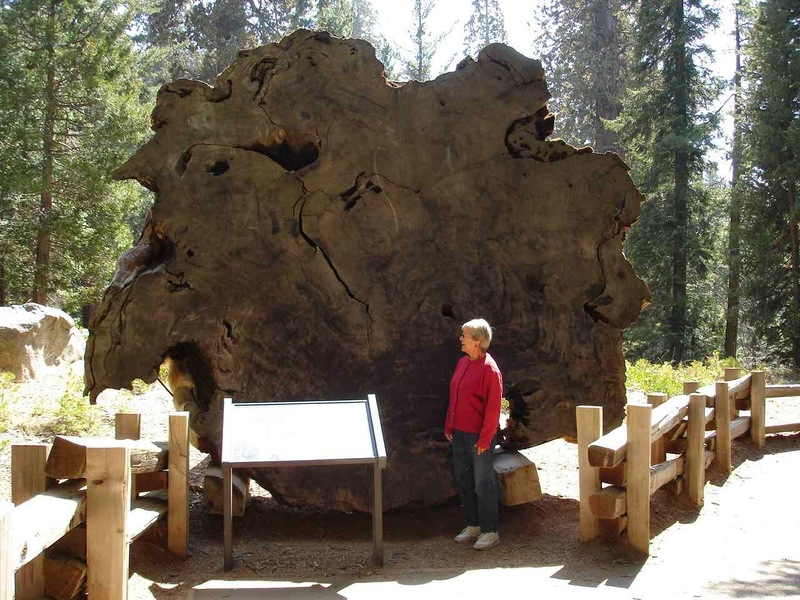 These trees grow so old because they are resistant to insects, fire, drought, and other hazards. For the same reasons the trees are slow to rot even after they have fallen. 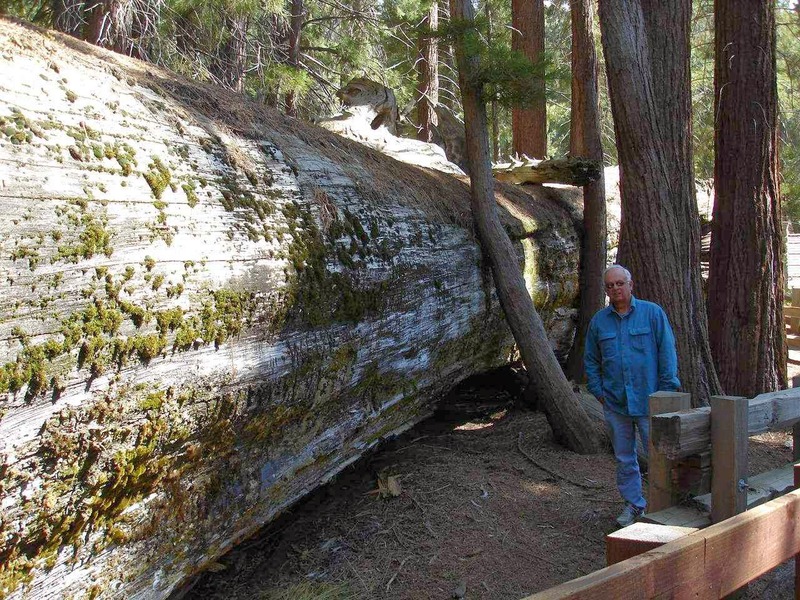 The most common cause for the death of a Sequoia is toppling over. 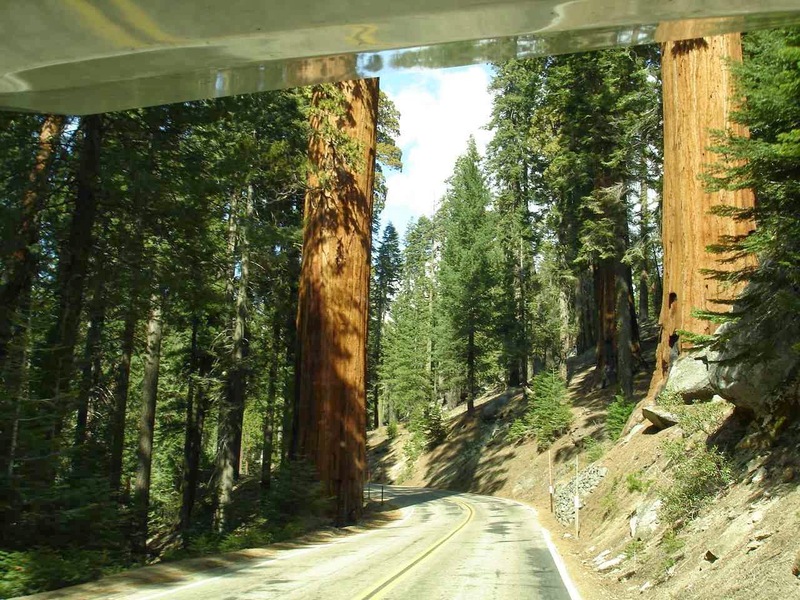 Sequoias are only found on the western slopes of the Sierra Nevada at 5,000 to 7,000 feet. only grow on the coast. Sections of this forest were almost wiped out in the late 1800's by logging companies. Luckily, a number of people realized how long it would take to replenish this forest---thousands of years--and preservation was begun. It sure puts a different perspective on your place in the grand scheme of things. This tree is the Sentinel. 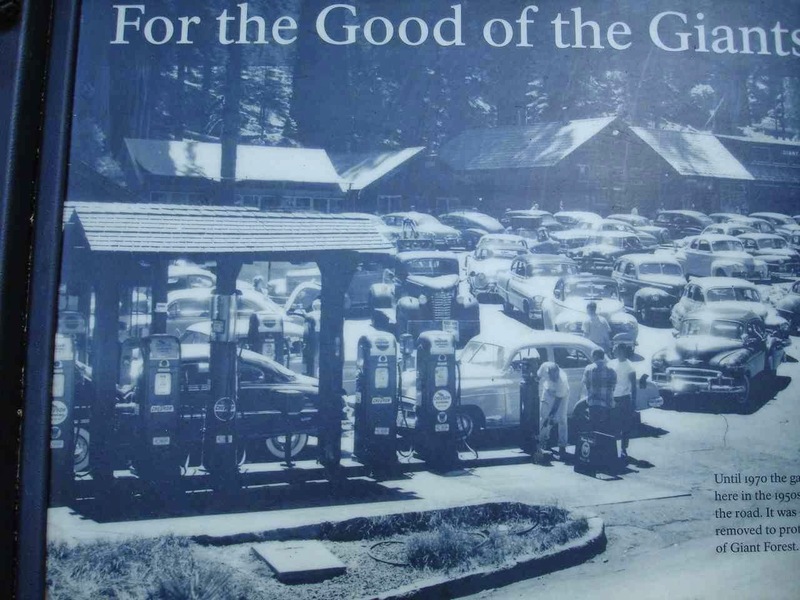 It is right on the Generals Highway in front of the Forest Museum which used to be a market years ago. This picture is of the front of that market in the 1950's. Love all the old cars--even a 1951 or 1952 Chevrolet similar to my first car. The Sentinel tree would be to the right of the cars. Out the front window of Lady Blue along the Generals Highway. 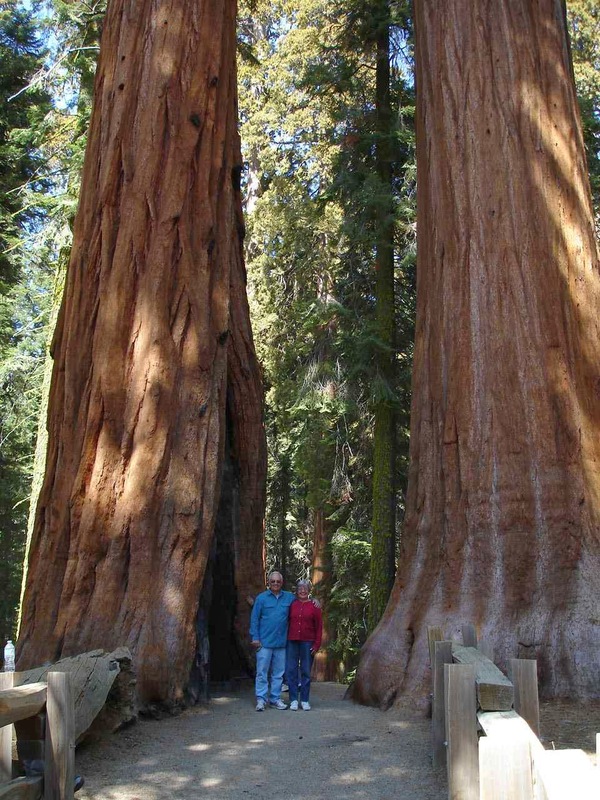 The other Sequoias grow fast and tall and then start to add width as the years add on. Is this karma or what. Here we thought we had been so nice , not bragging about the warm sunshine and lovely palm trees. Well---not too much anyway. And what happens--a light dusting forecast for snow becomes a 6 to 12inch snowstorm in the Sierras. 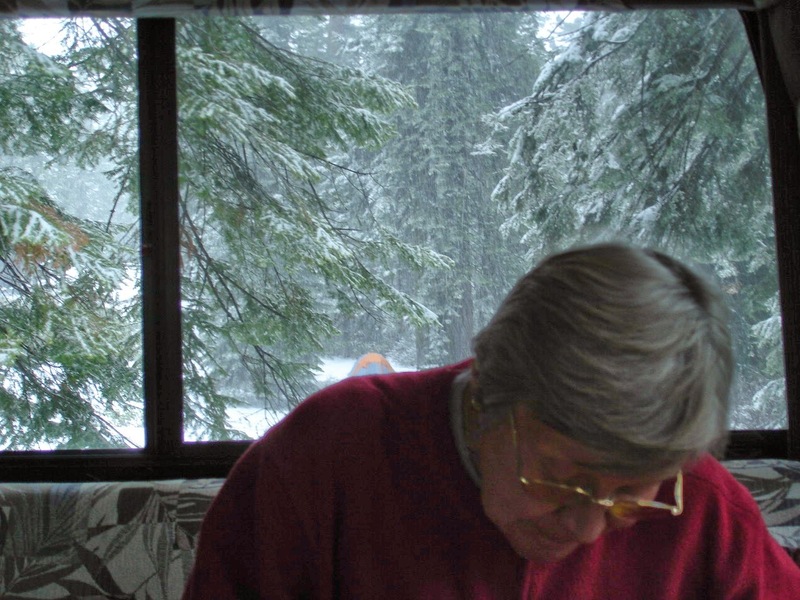 And --no travel allowed without chains.Not that you would want to go down those steep, winding roads in the ice. So, we will just hunker down and enjoy a mountain snowstorm. It is quite nice , catching up on things, and looking out the windows. Your pictures reminded us of our trip there in '08. Stayed at the same campground, sans snow. What a remarkable place to see. We wondered if you were getting snow! I think we've decided to skip heading east towards King's Canyon and Yosemite this trip and just stay closer to the coast. California is such a huge state it will take several more trips to see all we want to see.